Michael Jackson‘s daughter, Paris, is being deposed Thursday afternoon in Los Angeles in connection with a wrongful death lawsuit her grandmother, Katherine Jackson, filed against concert promoter, AEG, RadarOnline.com is exclusively reporting. Katherine contends that AEG was responsible for her son’s death because they were responsible for hiring Dr. Conrad Murray to be his physician. “The deposition will take place in a private interview room that is big enough to accomodate lawyers for Katherine, and AEG, beginning at 1:30,” a source tells RadarOnline.com exclusively. “The deposition could go all day. Even though Paris isn’t expected to testify at the trial, AEG wanted to take her deposition because she is a co-Plaintiff in the case. Prince Jackson, Michael’s oldest child, “was also deposed last week, and it didn’t go well for him. In fact the proceedings grew so intense for Prince, that a break was called, and it had to resume the next day,” the insider tells us. As RadarOnline.com previously reported, Prince plans on testifying at the trial, which is scheduled to begin in April. Katherine suffered a huge legal setback recently when a California court dismissed all but one of her claims against AEG and its president, Tim Leiweke. The defendants have filed legal documents with the Court of Appeal in California to dismiss that one claim, on the question of whether AEG Live negligently hired Murray, Jackson’s long time personal physician. Additionally, all but one of her claims against the remaining defendants were dismissed and the California Court of Appeals ordered Michael’s medical records unsealed. Murray was convicted in 2011 for the involuntary manslaughter death of Michael after administering a fatal dose of propofol to help the pop singer sleep. Thank you for posting Hes and Mary. "Defense counsel asked the boy completely irrelevant and repetitive personal questions about whether he sends text messages, whether he send text messages from his phone, and whether he 'tweets,'" they said. "Defense counsel also asked the boy about every place he had ever lived, every teacher he had ever had and about his current efforts to start a career in addition to being a full-time student -- none of which have anything to do with the case at hand." I really hope the kids are represented by an own attorney who can protect them and object when their privacy rights are getting violated and questioning is irrelevant and is getting out of hand. Whatever is going on I'm sure they are prepared and then recording how they are treated. Maybe at some point used against AEG. I think this is all part of the plan to takeover and for the truth to come out about Michael being set up twice with the allegations. Just reading parts of Paris deposition and the case. - Paris is about to begin her deposition, and is wearing a blue top, jeans, and brown Ugg boots. TJ Jackson is also with her. - AEG states they tried to avoid to depose Prince &amp;Paris but they are important witnesses as they stated they interacted with Murray b4 AEG. - AEG also states that Michael's kids are active in entertainment industry, have twitter accounts, make appearances and give interviews. - Prince goes to his deposition on March 2 with TJ, Katherine,3 lawyers &amp; security. AEG's lawyers arrange for them to enter unseen to offices. - KJ's lawyers wanted to move Paris's deposition to the court house rather than AEG lawyers offices. AEG doesn't understand this. - AEG states media reports this case extensively and they would report today's status hearing. Hence media would see Paris coming to court. - AEG states they did everything to ensure privacy for Prince but KJ's lawyers move to depose Paris at the court would expose her to media. - Interesting both parties blaming each other. KJ's lawyers claim AEG filed a motion so that media will be aware of Paris's deposition. - AEG blames KJ's lawyers stating bringing Paris to Court house would parade her in front of the media that's at the court for status hearing. - Also Jacksons only filed protective order for Blanket's deposition. 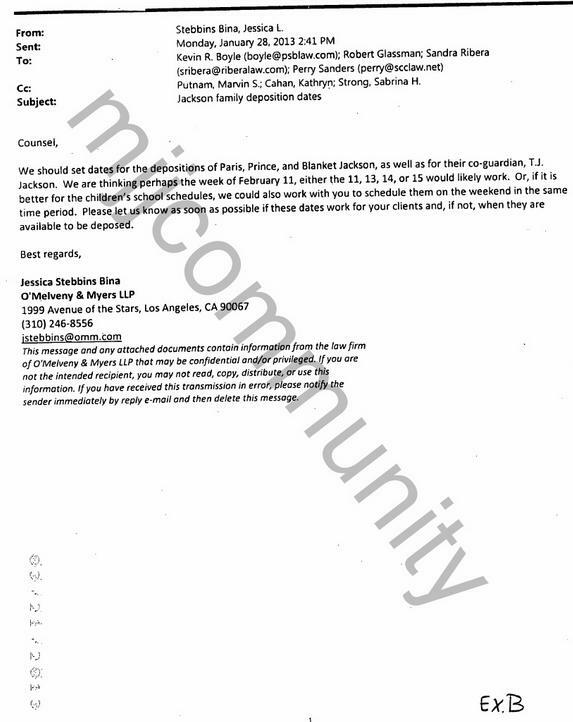 They did not seek protective orders to stop Prince & Paris depositions. - KJ's lawyer :" These are minors" AEG's lawyer: "These are plaintiffs. They are teens who hold jobs. They are very smart, attentive....". - AEG lwyr:"It's not strange to depose plaintiffs in lawsuit.They r teens I know of no reason why they cannot testify like any other witness". - The next will be information about Paris's responses to interrogatories / written questions. - Paris states Michael was happy about the ticket presales for TII tour &amp; excited about the tour & he wanted concert footage to be 3D. - Paris also states that Michael told her schedule for TII was "too much" for him and "Phillips and them were out to get them". - Paris says she saw Michael drinking red wine (making him sleepy), taking Tylenol &amp; Advil, medicine before he flies, IV fluids&amp; herbal shakes”. - Paris says she believed IV fluids for nutrition and she's only familiar with Internet rumors about Michael's alleged "drug addiction". - Paris says Michael told her not to take drugs because it would keep them from being healthy and productive. - Paris says one week before his death Michael was complaining about his body temperature would fluctuate from hot to cold. - Paris says within 2 days before his death Michael said to her Tohme was back on board because he had helped Michael with a house in LV. - Paris says Michael told her he wanted to do movies (write, direct, act) , combine his music catalog with movies and move to LV after tour. - Paris says she applied a white cream to Michael's back and shoulders. She tells how the hang out together in LA &amp; Las Vegas. - Paris says Michael encouraged them to read. If they wanted a toy, they needed to read books to get it. - Once Paris read 3 books over a weekend and Michael bought her a cat. - Paris says Michael told her "you need to be tough or people will take advantage of you". Thanks ashprak247. Please mention your sources! I´m following @Ivy_4MJ on Twitter, too. She has this info about what Paris said in the deposition. Asked where she got the info from she answered: It's from AEG's ex-parte motion to set a deposition date for Paris. Prince´s deposition is sealed however. Yeah thanks Mary. That's the girl who posted the tweets of Paris deposition today. Thought be worth posting all in one thread. I certainly think a lot will come out of the AEG case that Michael wants out there. - Paris says Michael said he trusted Dr. Murray and he liked Dr. Klein as a friend. Michael also said he liked Dr. Sabe, a holistic healer. There's a confusion. The quotes from Paris was NOT from her deposition. Those came from her answers to interrogatories/ written questions. Just thought it was interesting to see another Exhibit B on this AEG document about Paris' deposition (Front's hint). I don't know, but I'm seriously beginning to doubt Paris is the real deal. I know this doesn't sit well with most of you. But she seems to be anything but what her father must have taught her. This girl just doesn't sit well with me anymore. Anyways, after reading the filed papers I'm just stunned at the amount of people even surrounding Prince during his depositon. It's as if these kids (and stars in general) are a commoditiy, moved around and taken care of that noone gets too close. I'm seriously beginning to question the amount of security around celebrities in general. MK victims kept from being found out? I tend more and more to believe that the amount of security measures the amount of secrecy behind it. "Paris is about to begin her deposition, and is wearing a blue top, jeans, and brown Ugg boots. TJ Jackson is also with her. " Is there any photo evidence that she actually gave a deposition. Why is there no pic of her going into the court house? I know just because there's no pic, that doesn't mean it didn't happened. I just find it hard to believe that there's no 1 pic (especially if some one saw her well enough to describe what she's wearing) of her. If there's photo evidence can some please post a pic? Cause I've been searching high and low and still can't find one. Thanks. are they not required to use their legal names here? I do understand what this poster is saying, but I tend to feel that Paris is doing what her father taught her to do, put on her rhinoceros skin and stand tall. And she is doing it by design. Can you imagine how tough it is to be a girl who’s father is Michael Jackson and all the hate and heartache she would suffer if she was timid? She has to put up a facade of being rather tough and she does it well. She cannot afford to be a girly girl. She’s stunning and is proving that she is more than just another air-headed pretty face. I rather admire her for that. @ hesouttamylife I rather admire her for that. Well, I said this doesn't sit well with a lot of you. Yes, I've come to question if she really is NOT the Paris we all think: yes, an imposter. We all questioned her 'bedroom' looking like a fans' bedroom. I'm not going to press on that, it was just a note on the side. I however still think, that Michael would not want his girl showing off devil horns et al in public - being a teenager doing stuff like that or not is not the issue here now - knowing how he always was more or less polite with his enemies and was a faithful man. And if Paris is this faithful Daddy's girl she would respect his father by not acting like she does. She acts like she's kept on pretty lose leash. But hey - that's just my feeling. And her not showing up for the deposition - well, I tend to think there are some people behind her not showing up that steer this scene pretty well - and that is not MJ. Feels too sinister. But ... please, don't let me stop discussing the OP theme. We are not here to judge Michael's family we are here to investigate his faked death, I find it very disrespectful talking about Paris that way, let it be please.